Welcome to the doldrums of the movie season - studios are fully aware that folks are sticking closer to home after blowing the budget over the holidays. Throw the NFL playoffs into the mix and it's easy to get why the torrent of major releases comes to a near stoppage. No worries at the moment though - Christmas provides one of the biggest cash grabs for Hollywood with nearly everyone taking the week off. The Tuesday after Christmas raked in over $45M in receipts - a larger sum than this past Saturday. *UPDATE* Teenagers can't resist burning their cash on movies that possess an 8% rating on Rotten Tomatoes - 'The Devil Inside' is on track for over $20M ahead of a spectacular word-of-mouth crash thanks to what's reportedly one of worst endings in the history of film. 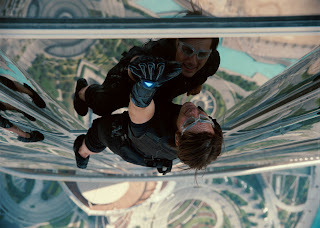 Mission: Impossible - Ghost Protocol ($17M) - With a domestic total of $147M and an overseas take of $246M - rumors of Tom Cruise's demise have been resoundingly quashed. It's already topped MI3's total take - Cruise's last $100M+ movie some five years ago. Sherlock Holmes: A Game of Shadows ($10M) - To give you some idea of how huge the holidays are for Hollywood - SH2 opened to just $40M in mid-December but it's since added $100M to the take which horrifyingly all but guarantees a SH3. The Devil Inside ($9M) - The one segment of the population that will spend their allowances at the multiplex - teens. What better than a run-of-the-mill horror flick to tempt them to toss aside their XBox? One slight problem - it's rated 'R' - Paramount should have made the necessary cuts to get it to a more coffer-friendly 'PG-13'. Girl With the Dragon Tattoo ($9M) - After a tepid start thanks to the highly questionable holiday release date - David Fincher's adaptation of the best-selling book has racked up $64M - well off what Sony expected at this point. Plans for the trilogy are now in limbo.